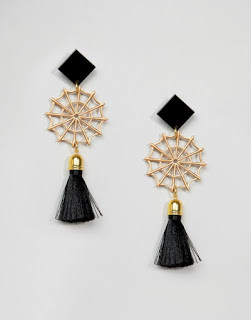 If like me Halloween costume dressing is not your thing, then a cool pair of quirky earrings or a statement ring can be a better investment instead. I've picked out a few sinister looking Halloween inspired jewellery pieces to get you through a Halloween costume dilemma. It's all about the symbolism of Halloween; eyes, skulls and cobwebs make for great motifs. 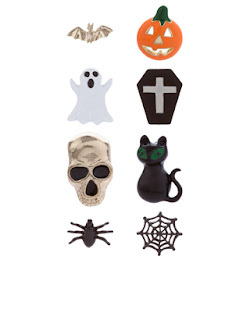 Get your spook on with this eight-piece Halloween stud earring set, featuring a bat, pumpkin, ghost, coffin, skull, black cat, spider and cobweb designs. If you are off to a few parties this is great for mixing it up at each one. 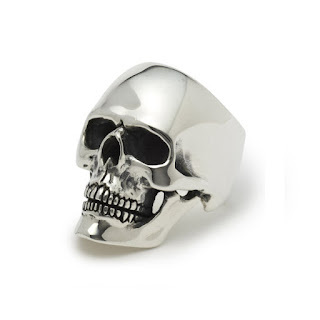 The skull ring is an absolute classic and can be worn all year round. The Great Frog is the place to go if you want to buy good quality silver rings, especially as this ring weighs 40g it's a real investment piece. This necklace from Tatty Devine is one of my favourites as it's unique compared to other pieces in this edit. A good price for a piece that you may only wear once a year but you'd be happy to get out each Halloween again and again. 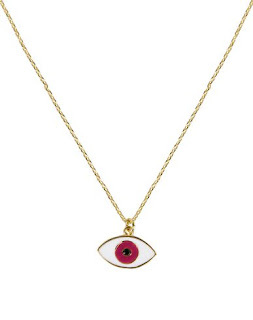 With so many evil eyes on the market, this one stands out from the crowd with its white background and pink iris. This is another piece that you could wear all year round and the purse friendly makes this an easy purchase. 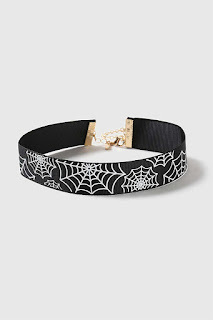 Topshop has made party dressing super easy and stylish by combining the choker trend with some spooky Halloween twists. If you have no interest in wearing a costume wear your favourite dress and add one of these to get into the ghoulish spirit. 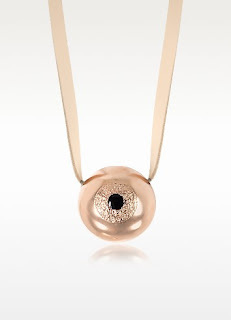 Super edgy and spooky this necklace is from Bjorg's Odyssey MMXIV collection. Its 18ct rose gold plated bronze with a leather strap. A more glamorous and grown-up take on Halloween Jewellery, this piece has been on my personal wish list for a long time but Halloween is the perfect time to get this piece out. This Ghost is so cute I couldn't bear to leave it out of our Halloween edit. The acrylic brooch glows in the dark just to make it that much cooler and leave a lasting impression of those inky eyes. It's also an absolute steal at £25.00.